Reading about our country’s missions to space? That’s a small step toward understanding the people power involved. Experiencing those missions yourself, seeing the actual rockets towering above you and chatting with people passionate about space exploration? That’s a giant leap toward inspiring a young person for life. Hands-on STEM experiences are what Space Camp is all about. Like Scouting, the program puts young people in an environment where all five senses are engaged and learning comes naturally. A Boy Scout troop or Venturing crew acquires leadership skills in the context of a fun weekend campout. Similarly, a Space Camp team gains STEM skills and inspiration outside of the classroom. Dr. Kay Taylor, Space Camp’s director of education, says Space Camp recognizes the benefit of formal education. The goal isn’t supplanting formal schooling; it’s supplementing it. I met with Dr. Taylor to get a closer look at Space Camp, the ways in which its mission and Scouting’s mission parallel, and to learn how their STEM education has evolved since I attended more than 20 years ago. If you like what you see, find info on Space Camp’s Black Friday weekend sale at the end of the post. STEM has become such a buzzword that you probably don’t need reminding what it stands for: science, technology, engineering and math. But it’s worth repeating that STEM jobs are in high demand. Jobs that didn’t exist a generation ago, like software engineers, can now earn $100,000 a year or more right away. Taylor says Space Camp wants to address the “very serious reality of not enough kids going into STEM-based careers” by introducing young people to exciting, well-paying jobs. Pat Ammons, Space Camp’s director of communications, agrees. Learning with all five senses means more than just memorizing dates and names. It means examining historic artifacts, spinning around on a multi-axis trainer and exploring a model of the International Space Station. The goal isn’t necessarily training the next Neil Armstrong. It’s more about inspiring the next, say, Elizabeth Bierman. Bierman is a past president of the Society of Women Engineers. But before that, she was a Space Camp graduate. The link between Scouting and the space program has been well documented. Less known but equally potent is the longstanding relationship between Scouting and Space Camp, part of the U.S. Space & Rocket Center in Huntsville, Ala.
Then there’s the more practical alignment, like merit badges. 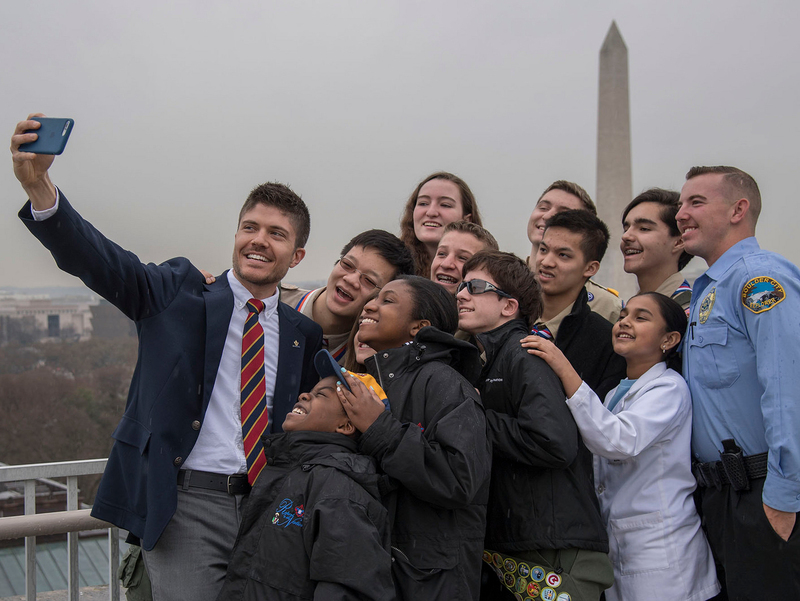 Depending on which weekend or weeklong program they choose, Boy Scouts can earn or work toward the Space Exploration, Aviation or Robotics merit badge. But even more valuable that a completed blue card is the ability to become embedded in the space program. As a 1995 Space Camp graduate myself, I can tell you It’s impossible to leave and not be inspired.